In the twentieth century Polonias (Polonians) across Western New York began to flex their political muscles. They would elect their own as alderman; councilmen; mayors of Buffalo, Dunkirk, Lackawanna, and North Tonawanda; representatives on the Chautauqua, Erie and Niagara legislators; state senators and representatives, all the way to the halls of Congress, while filling in just about every political office in-between. But before they could do all that, Poles needed one leader to organize behind, and that man would be Jacob Johnson of Fredonia. Jakob Jasiek was born in Piaseczno, near Warsaw (Bydgoszcz), Poland in 1853. When Jakob was four, he left with his family for the New World, finally settling in Dunkirk. An intelligent boy, Johnson did all he could to secure an education in Dunkirk. Around age 11, he learned all that the city had to offer and enrolled at the State School at Fredonia. To earn money he began working for as a farmhand and domestic servant for Duane L. Guernsey, an affluent area land owner. While living with the Guernseys, Jacob demonstrated his aptitude in not just academics but agriculture as well and the family began accepting him as one of their own. Living on Central Avenue near the heart of Fredonia, Johnson was constantly exposed to English and as he continued his education, he mastered the language of his new homeland. 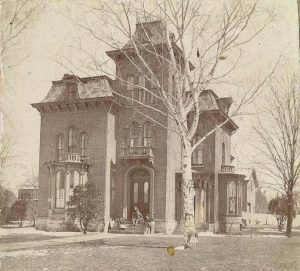 Finishing up school in Fredonia, Johnson was encouraged to attend Cornell University so he could better manage the Guernseys’ estates. After he enrolled he was approached by Father Pitass of St. Stanislaus Church in Buffalo, who was looking for a teacher for the parish’s new school. When classes began in 1874, Mr. Johnson was there to meet the students. As the English and math teacher, Johnson had plenty of interaction with the students and by extension their parents. Again and again, Johnson proved himself to be a leader of the Poles. 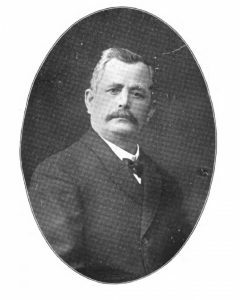 To help his community gain a voice in government, Jacob started the Polish-American Democratic Club in 1884 with James Rozan being elected its first president. Then in 1888, when debates raged about where the East Buffalo Market should be located, Jacob came out as a strong advocate for it to being on Broadway, speaking passionately before the market committee. Finally in 1890 he worked to get Rozan on the board of supervisors. With Rozan in place, Jacob began planning for the 1891 Buffalo city election and the opportunity to become its first Polish alderman. In the summer of 1891, Johnson began to heavily canvas Buffalo’s 9th Ward, the area around Broadway, Fillmore, William, and Adams Streets for the alderman’s seat. By the end of October, the Democrats held their convention and Jacob was on the ballot. The only thing between him and the seat was longtime Republican operative Louis Kirchmeyer. To defeat Kirchmeyer, an establish name in the split German-Polish Ward, Johnson would have to harness the full power of the Polish people, regardless of where they sat on the political spectrum. Because of his experience as a teacher, and his ventures running a real estate office and steamship agency, Johnsons (Johnson) was considered to be the more industrious, level-headed and trustworthy of the candidates. With the support of the Poles and much of the press, Johnson went into the November 3rd election hopeful. After the polls closed and the ballots counted, Jacob Johnson was elected the first Polish alderman in the history of Buffalo, by 74 votes. Led by Johnson and Rozan, more Poles started running for and winning elections in the Democratic Party. Johnson only served one term, before becoming Chief Deputy Collector of the Internal Revenue Service, but his influence in politics was recognized at the highest levels, even garnering him an invitation to the inauguration of President Cleveland in 1893. After politics, Johnson remained active in Polonia and the East Side where he took care of his children and grandchildren. Jakob Jasiek passed away in December 21, 1914 and is buried at St. Stanislaus Cemetery in Cheektowaga. "Buffalo's First Polish Alderman Called By Death." Buffalo Courier [Buffalo, NY] 22 Dec. 1914: 7. Print. "Democratic Aldermen." Buffalo Courier [Buffalo, NY] 1 Nov. 1891: 12. Print. Drzewieniecki, Walter M. James M. Rozan: A Pioneer Polish-American Politician in Buffalo. United States: Publisher Not Identified, 1972. Print. "Jacob Johnson, First Polish Alderman, Dies." Buffalo Evening News [Buffalo, NY] 21 Dec. 1914: 6. Print. Johnson, Robert J. "Bob's Blog (Page 8)." Bob's Blog (Page 8). Polonia Music, 4 Nov. 2015. Web. 23 Feb. 2017. Johnson, Robert J. "Early History of St. Stanislaus Parish in Buffalo, N.Y." Polonia Music. N.p., n.d. Web. 23 Feb. 2017. "Our Little Poland." The Illustrated Buffalo Express [Buffalo, NY] 28 June 1891: 1. Print. "Our Polish Colony." Buffalo Courier [Buffalo, NY] 29 Mar. 1892: 5. Print. "Plum for the Poles." Buffalo Courier [Buffalo, NY] 12 Dec. 1893: n. pag. Print. "The Fall Election." Buffalo Courier [Buffalo, NY] 20 Sept. 1891: 5. Print. "The Official Ballot." Buffalo Courier [Buffalo, NY] 30 Oct. 1891: 5. Print.